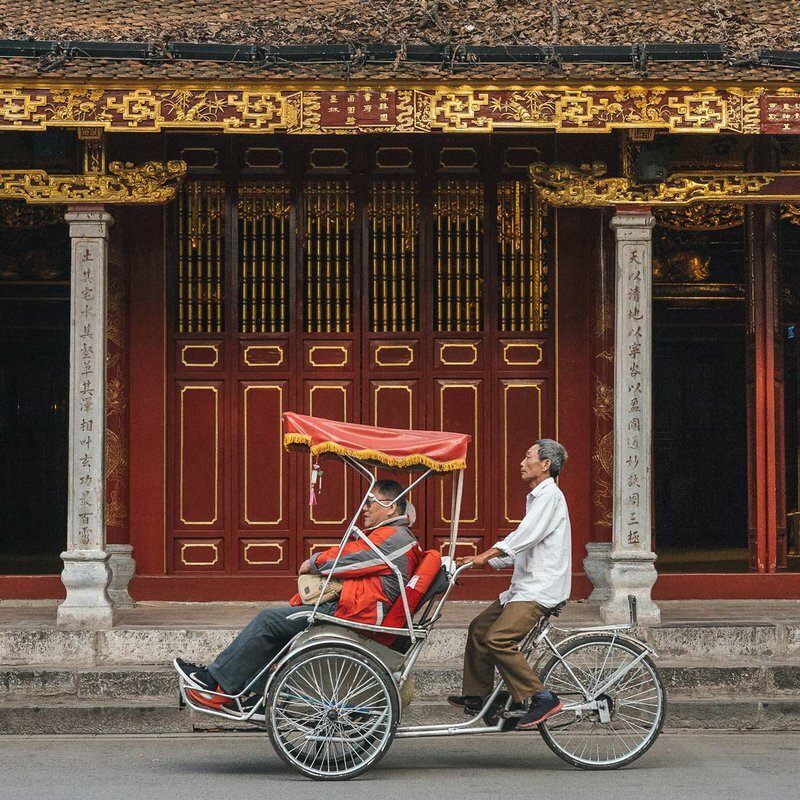 Only have a few days in Hanoi? 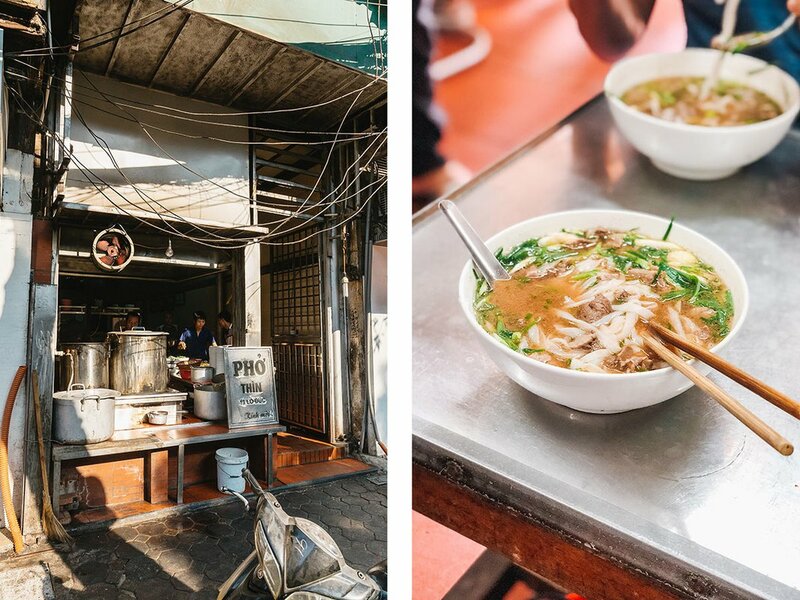 Pack the camera, bring an empty stomach, and hit the streets. 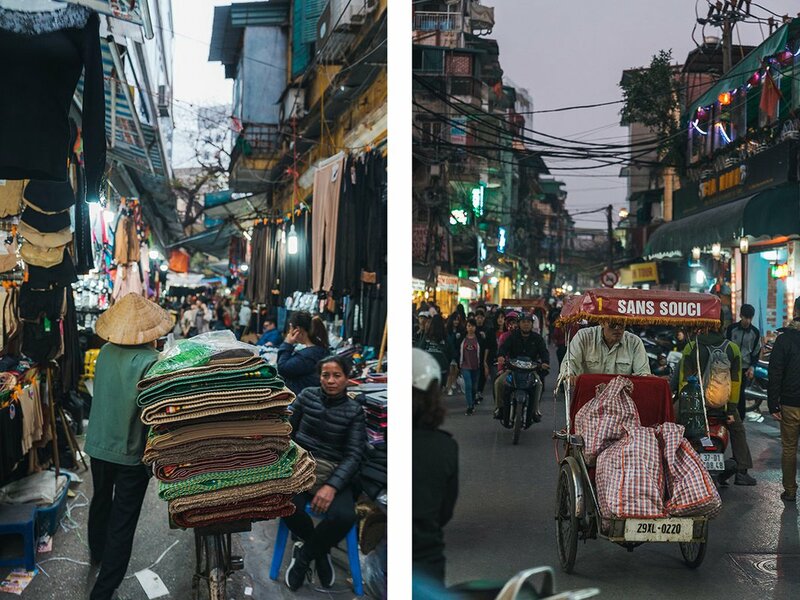 HANOI, Vietnam — Over the holidays, I took a two-week family vacation that started in Sydney and finished in Singapore, with a quick jaunt to Hanoi in between. 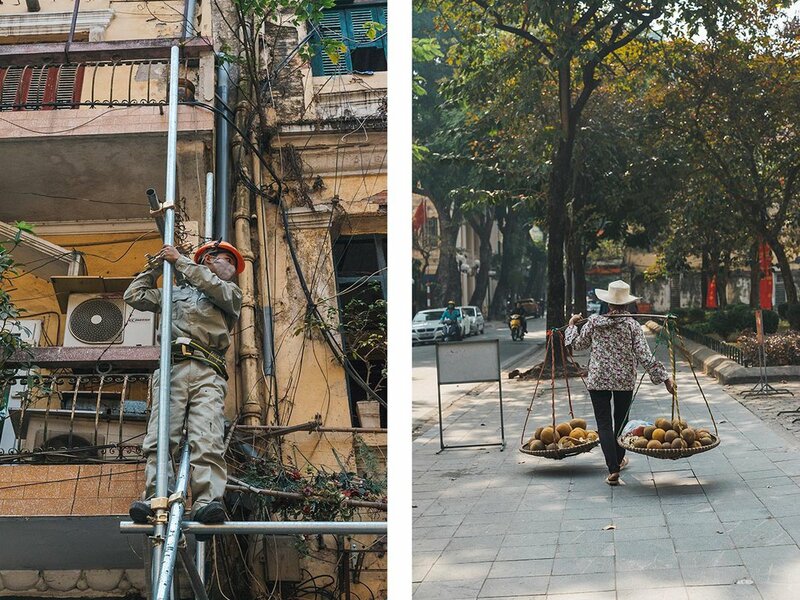 Though three days in Vietnam's capital was far too brief, it was a major highlight. As an enthusiastic street photographer with a bottomless stomach, the experience was particularly inspiring. The locals were wonderful, the food was phenomenal, the streets were buzzing, the low prices were unheard of (I spent $0.66 on an Uber! ), and the photo ops just kept coming. The City of Lakes, as it's sometimes called, is an ancient and thriving metropolis with districts new and old. To make the most of my time, I explored the bustling, narrow streets of the Old Quarter and the tree-lined boulevards of the French Quarter — eating, snapping, and dodging traffic. Buildings of the French Quarter (left) and the Old Quarter (right). Temples are a common sighting in the Old Quarter. Traffic scenes from the city center. 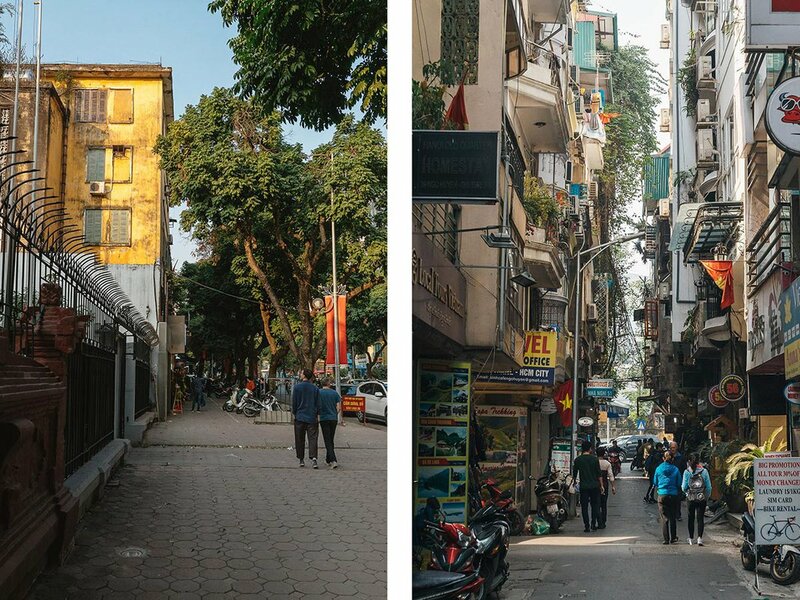 Hanoi is a madhouse, a city in a constant state of entropy. Buildings are set in a beautiful state of decay, a reminder of a long and complicated history. Clothes and signs and wires dangle from balconies and rooftops, which makes the exercise of looking up in alleyways a particularly rewarding experience. 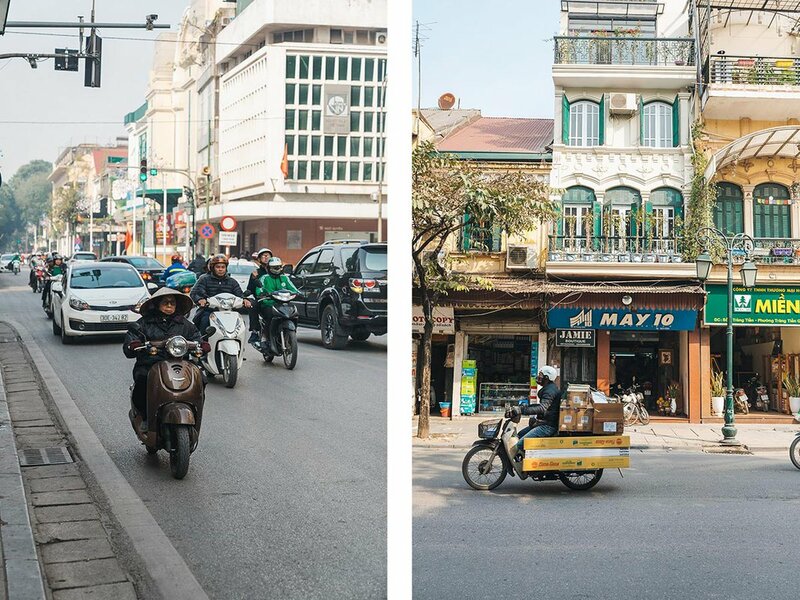 On the ground, bikes and scooters fly through red lights, down narrow corridors, and along the wrong sides of streets with almost no regard for right of way. Crossing the road feels like diving in front of a school of hungry barracuda, only to realize these fish aren’t interested in your kind. With ease, they adjust around you. How this system is able to work without everyone developing road rage is a mystery. The only explanation I can think of is that Hanoians are incredibly laid back, content with maneuvering a family of four on a motorbike while carrying bags, dodging pedestrians, and hitting the breaks every ten seconds. A street barber and snack vendor. Inside the 36 Streets section of the Old Quarter. Everyone is selling something in this communist economy, one of the fastest growing in the world. In the 36 Streets district of the Old Quarter, there is an order to things. Each street (there are more than 36 now) sells one thing: jewelry, silk, cotton, bamboo, Chinese medicine, string instruments, fish sauce, and votive papers, to name a few. Elsewhere, it's whatever you can hawk on the street. 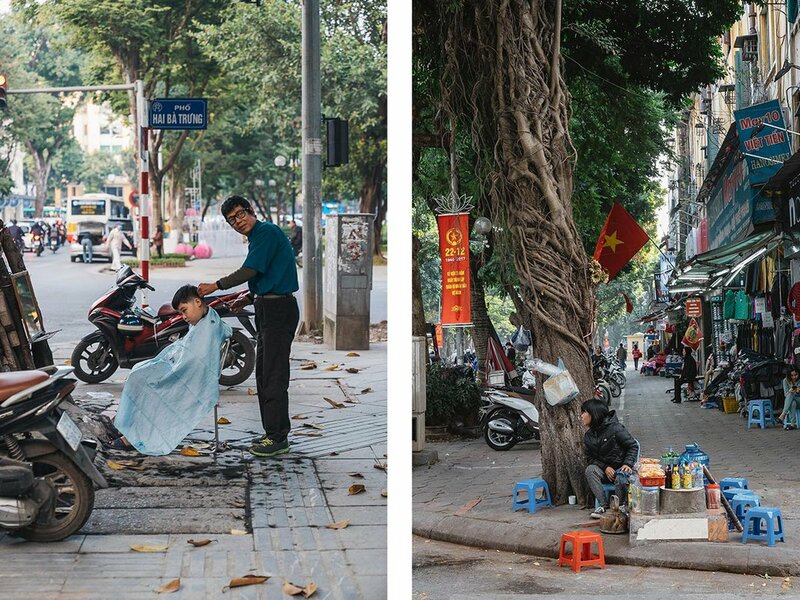 In my three days, I was accosted by a lineup of sidewalk barbers, chaps selling tracksuits, kids advertising seats at restaurants, men offering motorcycle rides, and plenty of street peddlers shlepping everything from fruit to fish over their shoulders. I could only admire their resolve. One night, after emerging from a dank bar in the Old Quarter, we found no one on the street save one elderly woman who quickly drew closer with what looked like puffed rice snacks for sale. We paid her efforts no attention. She returned the favor by pinching our elbows and refusing to let go until we listened to her sales pitch. The two-story flat was basic (the sink was the shower) but charming, though in retrospect, we should have booked a hotel, as there are plenty of fine and affordable boutique options in the city, like La Siesta Central Hotel & Spa and Essence Hanoi Hotel & Spa. Our biggest gripe with our Airbnb was its location next to a crowded church that kept us awake with carols on Christmas Eve and woke us every day with bells that started ringing at five in the morning. An upside to all of this: We were a block away from Quán Phở Thìn (13 Lò Đúc; +84-162-769-7056), which serves a particularly good bowl of rich and smokey phở laden with delicious stir-fried beef and lots of spring onions. Coupled with a few sticks of fried bread, our first meal in Hanoi was nearly perfect. Bún riêu crap soup from Ms. Thu's street stall, located near St. Joseph's Cathedral. 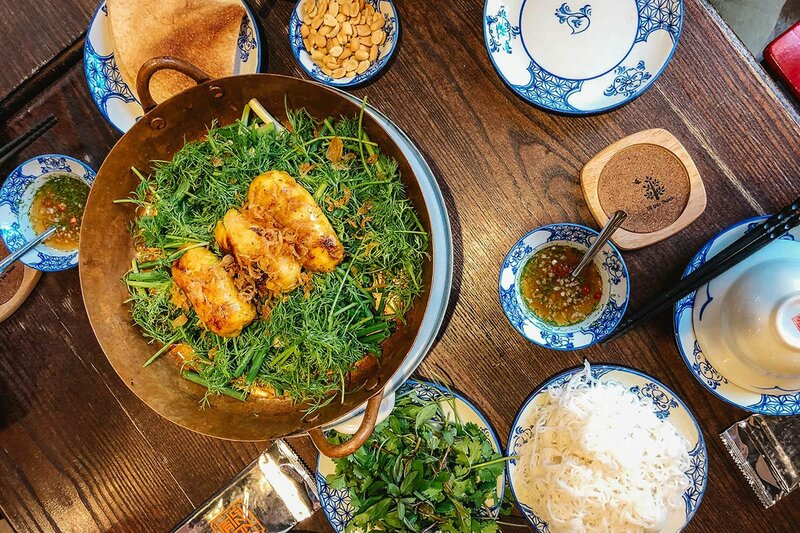 Hang Son 1871's take on cha ca la Vong, a quintessential Hanoian dish of catfish cooked in turmeric and herbs. Green mango salad with dried beef, chicken, and squid. Not enough can be said about Vietnamese cuisine, its delicate balance of sweet, salty, spicy, and sour flavors rendering even voracious eaters like myself satiated without needing to overeat. 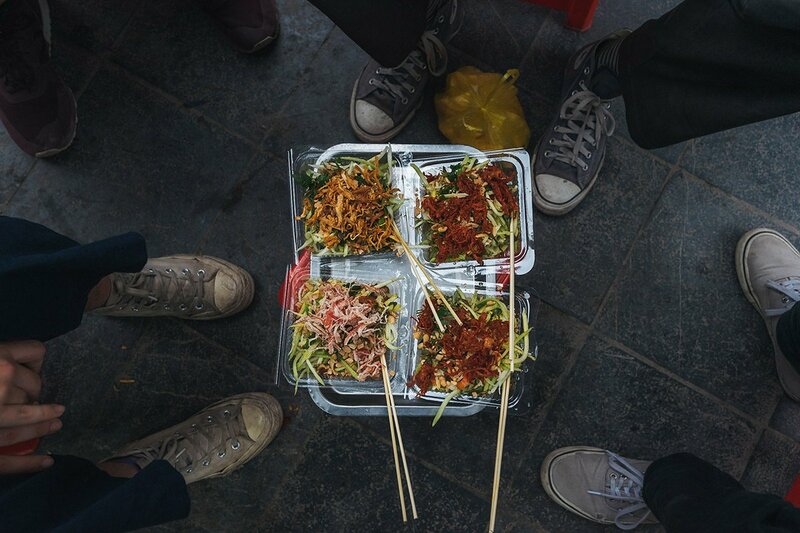 There are many things to sample in Hanoi, and I only got to a few of them. Here are the spots I recommend. Ms. Thu serves delicious bún riêu crab soup from a modest street stall in Thọ Xương Alley near St. Joseph’s Cathedral. I had to ask for help locating it, but it was worth the early morning hunt. 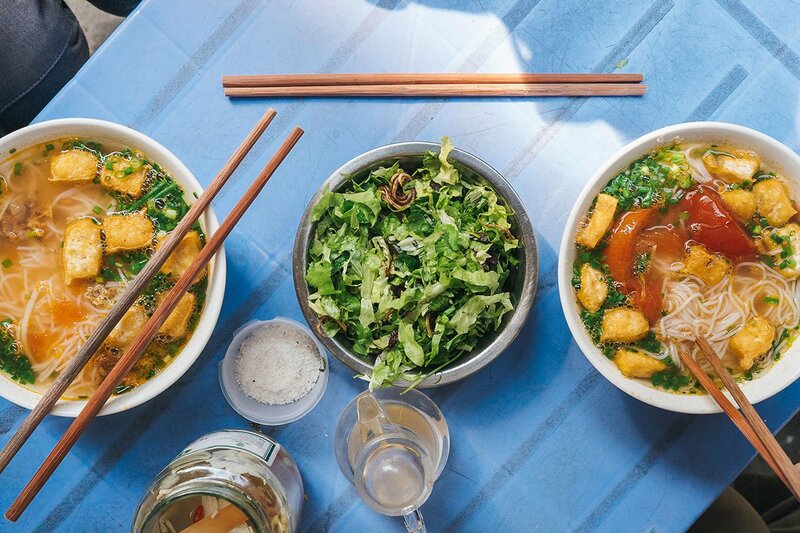 The other days, I slurped down beef pho at Quán Phở Sướng (24B Trung Yên; +84-91-619-76-86) and brunched in the rooftop garden at The Hanoi Social Club, a cafe popular with creatives both local and foreign. I was on the fence about egg coffee, but was told to I try it at Cafe Đinh. The hole-in-the-wall makes it well and feels very locals-only. 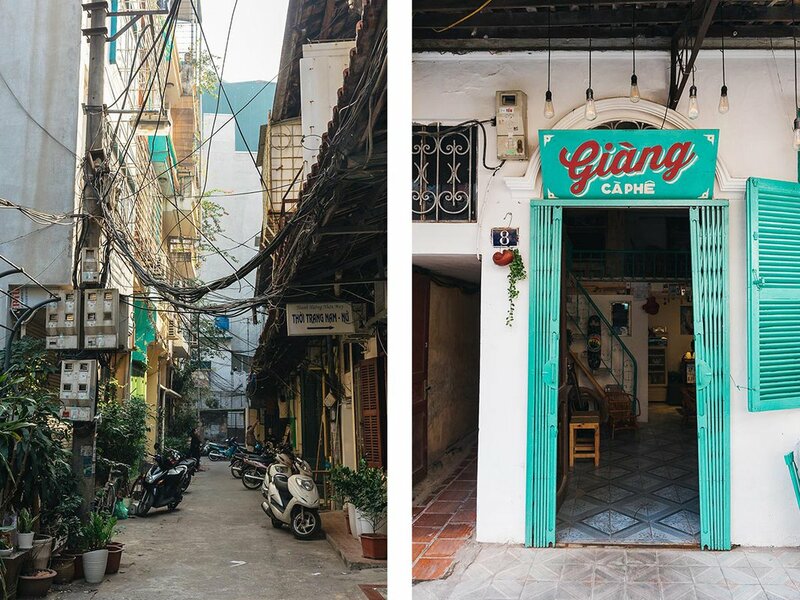 Hàng Sơn 1871 does a nice spread of Vietnamese classics that looked good on my Instagram feed. Moto-San Uber Noodle, tucked away on a quiet side street, was a nice place to relax and have a banh mi and a craft beer. Madame Hien, recommended for a nice lunch by the concierge at the Metropole hotel, was pretty (it's in a former villa) but overpriced. I'd skip it next time around. State-Run Food Shop No. 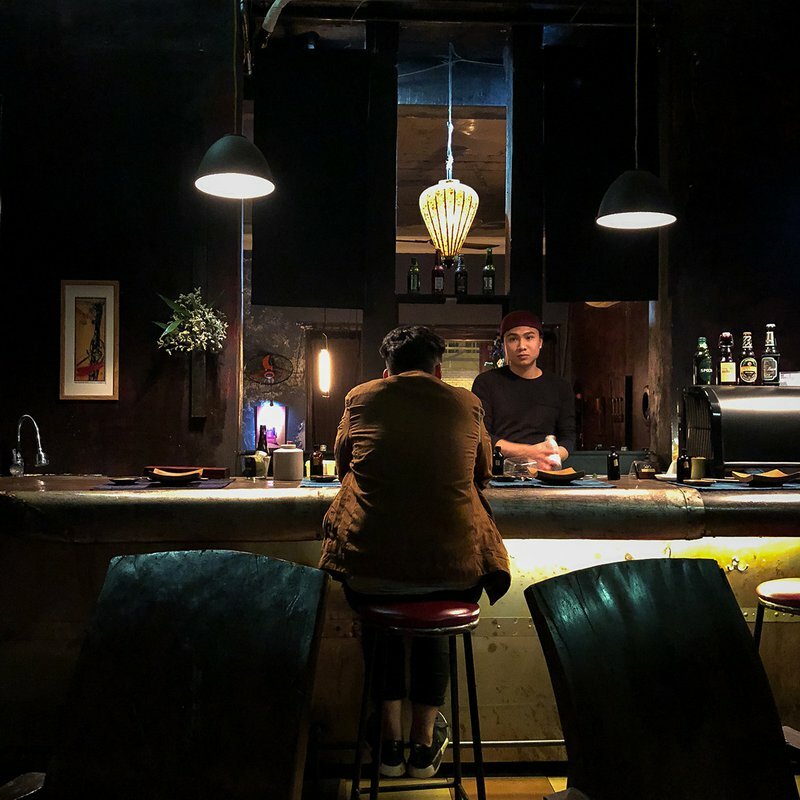 37 (37 Nam Tràng; +84-24-3715-4336) serves dishes inspired by the northern food consumed during the American War in a space that recalls an underground bunker. My dish of choice: an empty shell of fried rice with slow-cooked beef on the side. Bún Chả Hương Liên, the paired-down barbecue spot made famous for hosting Barack Obama and Anthony Bourdain for dinner, isn't the best bún chả in town, but worth the meal if you're in the area. For drinks, Tadioto Bar, an artsy watering hole with a sushi bar, has a great vibe and solid drink selection.